Hot spots indicate a rock weakness such that magma can sweep under the rock, heating the overlying rock. Hot spots are frequently in stretch zones, as the many hot spots across Africa and in the African Rift show. Unless the stretch pulls the rock apart sufficiently, no oozing of magma will occur. Some hot spots occur where subduction occurs, rock layers are being pushed under the hot spot, so that for instance the oozing volcano under Hawaii will die back, eventually, as the rock layers push together forming baffles for the magma. 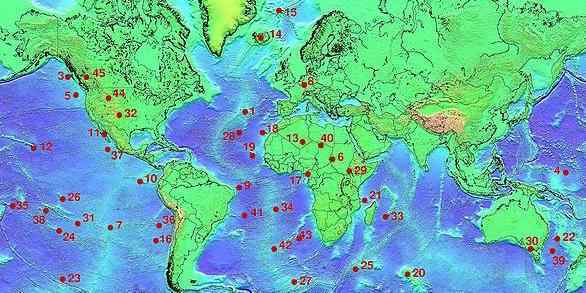 Hot spots in the Pacific are found along the borders between the Pacific plate, which are many and not the single plate assumed. Yellowstone is a famous hot spot that will likewise lose its strength over time, because the American west is being pushed over Pacific plates. During the pole shift, Hawaii is expected to only continue oozing, and Yellowstone is expected to respond not as a super volcano but as any other volcanic reaction to the magnitude 9 quakes besetting the globe. Hot spots in the interior of a plate not subject to nearby subduction or to a stretch will react during the coming pole shift according to the stress on the plate. Australia and the waters between Australian and New Zealand have hot spots that are where the rock layers are thin, and bending as the Indo-Australian plate lifts there. Thus, with pressure beneath them eased, these are unlikely to erupt or ooze. Germany will find its caldera likewise unaffected, as the Atlantic will spread, the Eurasian Plate pulled apart lengthwise to form a new inland bay at Pakistan, and the pressure eased at all points in between.